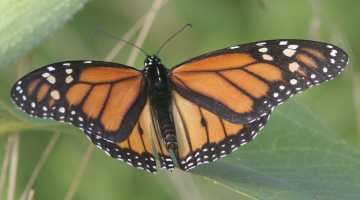 Monarch butterflies are toxic to predators because of a chemical in the milkweed leaves that they eat as caterpillars. The monarch's bright orange colors warn away birds that might want to make a meal of it. The familiar favorite, the monarch butterfly, is one of the many delightful sights in Westborough's fields, gardens, and forests, now that milkweed is in bloom and butterfly season is in full swing. Have you seen your first monarch (Danaus plexippus) yet this year? And if so, are you sure it was really a monarch? Or was it a viceroy (Basilarchia archippus, Limenitis archippus) – another large orange butterfly that looks almost the same as a monarch? Westborough has both in July, although monarchs may be more common. How can you tell these large orange butterflies apart? The differences are subtle. From a distance, if you're standing near a field or garden, watch how the butterfly flies. All butterflies move quickly, but monarchs tend to flap their wings and then glide, holding their wings in a "V". Their flight has a lazy look to it. Viceroys seem in more of a hurry, with their wings constantly fluttering. They hold their wings out flat for brief glides. Their flight is darting. Viceroy butterflies in our area look very much like monarchs, but notice the horizontal black line inside the border on the hind wings. Viceroys are bad-tasting to birds because of the asprin-like chemical in the willow leaves that their caterpillars consume. Viceroys share the monarch's warning coloration. The Mass Fish and Wildlife fields off Rt. 135 are a good place to find both monarchs and viceroys. Walk along the dirt road that leads to the model airplane club's landing field, and look for patches of milkweed. Later in the month, look for purple loosestrife. It's a notorious invasive plant, but the butterflies do seem to like it. With wingspans of 3 1/2 to 4 inches, monarchs are a bit larger than viceroys, which have 2 1/2 to 3 inch wingspans. Of course, this size difference can be hard to notice. 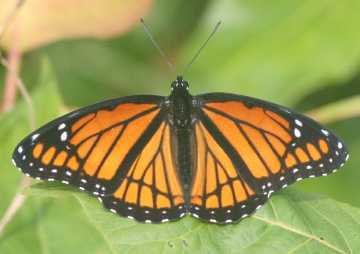 In a close view, you identify a viceroy by the black line along the inside of its hind wings. Monarchs don't have that line. You can usually spot it on viceroys whether their wings are open or closed, but it's easier to see when their wings are open. You might expect two such look-alike butterflies to be closely related, but that's not the case. Monarchs belong to a group called "milkweed butterflies'' because their caterpillars they feed only on plants in the milkweed family (Asclepia, Apocynum). The monarch is one of the few milkweed butterflies in North America, since most live in the tropics. Viceroys, on the other hand, are not in this group. As caterpillars, they especially like willows (Salix) but also can feed on poplars and aspens (Populus), apples (Malus), and cherries and plums (Prunus). So what are these two different butterflies doing as look-alikes? The diets of these butterflies in their youth – during their caterpillar stage – have something to do with it. Caterpillars of both monarchs and viceroys manage to eat leaves containing chemicals that usually discourage insects from eating the leaves. The chemicals that the caterpillars consume are different, but in both cases the caterpillars' bodies store and even concentrate the chemicals. Later, the chemicals make the adult butterflies an unpleasant meal for birds, which then learn to avoid the bright orange butterflies. Their look-alike appearance helps both butterflies, because birds that have dined on one will avoid both in the future. 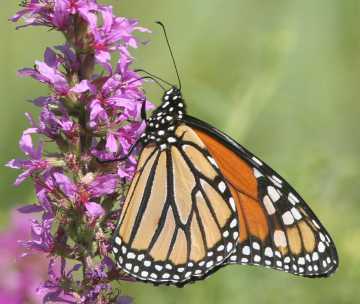 This monarch takes nectar from a purple loosestrife blossom, providing a view its folded wings. In late summer local monarchs build up fat to fuel their migration to Mexico for the winter. In the case of monarchs, the caterpillars eat milkweed, which contains a toxic chemical known as a cardiac glycoside, which affects the hearts of animals. Even cows can get sick from munching milkweed. But monarch caterpillars tolerate this toxic chemical, and it is concentrated in the veins of the wings of monarch butterflies. Birds become violently ill when they eat a monarch. Viceroys aren't toxic, but birds avoid them as if they are. For a long time, scientists believed that viceroys were perfectly edible, but it turns out that many viceroys are bad-tasting and perhaps unsettling to the stomach. The reason? The willow leaves that viceroy caterpillars like to eat contain a bitter chemical related to aspirin that protects willows from many insects. The viceroy butterfly contains it as well. In the case of monarchs and viceroys, both butterflies benefit from their similar appearance, because each is protected by their predators' bad experience with the other. Over time and many generations, viceroys that looked less like monarchs tended to get picked off, leaving the look-alikes to prosper and reproduce. In parts of the southeastern U.S., things have worked out a bit differently. There, large mahogany brown milkweed butterflies known as queens (Danaus gilippus) are more common than monarchs, and the local viceroys look more like queens than monarchs. What about the caterpillars? Unlike the butterflies that they become, monarch and viceroy caterpillars are not look-alikes. The monarch caterpillars advertise their toxicity with bright yellow, black, and white stripes. This "warning coloration" makes it easy for birds to learn avoid to avoid them. In contrast, viceroy caterpillars find safety in disguise. They look like bird droppings. Their splotchy white, black, and brown appearance hides them in plain sight on the leaves they munch. Their disguise protects them while they build up enough bitter chemical in their bodies to taste really bad. We don't really get to see it in Westborough, but remarkably, monarchs migrate south to Mexico to survive winter. As the days shorten in late summer, and asters, goldenrod, and joe pye weed bloom, the monarch migration gets under way. Butterfly watchers travel to places in Rhode Island such as Block Island or Sachuest Point National Wildlife Refuge R.I. to witness hundreds of monarch migrating in late September. These butterflies pass the winter clustered on fir trees in the cool, foggy mountains of central Mexico. In the spring, they migrate northward again. Along the way back, they lay eggs and die, but the next generation – and perhaps the one after that – continues the journey north. In this way, each year monarchs repopulate North America. If you saw your first monarch in May of this year, it had probably just arrived back in our area. And the viceroys? They don't leave the area. Instead, the second generation of the year passes the winter as partly grown caterpillars. They roll themselves up tightly in partly eaten willow leaves and go dormant until spring.